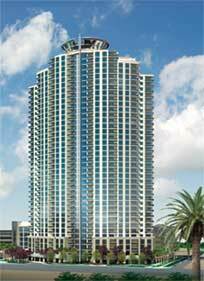 Allure Las Vegas high rise condos on the north Strip will see first residents the end of October. Allure condos area a value proposition for luxury living in Las Vegas, Nevada. The condos for sale offer more square feet per dollar, great use of architecture, fantastic amenities and higher ceilings for a spacious home in this 41 story high rise. Some of the incredible amenities in this Las Vegas high rise condominium include a fitness center with locker rooms and a media center, overlooking an outdoor pool with private cabanas. A business center offering high speed internet computers, WiFi, 24 hour security, storage and valet parking area all offered to residents. A unique architectural feature of this high rise is feng shui design.